Looking for a translation? We have several translated versions of this guide here. Can I trust this project? Why would I want to participate in this and purchase P3D tokens? Is this a scam or a fraud? Alright, but what are the risks? Am I initially losing money when I exchange my Ethereum for P3D? This is a simple beginner's guide to the Proof of Weak Hands 3D Exchange. Read below to learn about how to get started and why you might want to participate! Looking to join the community? Jump into the official POWH3D discord chat and use the #helpdesk if you have questions or just pop into #general to say hello. 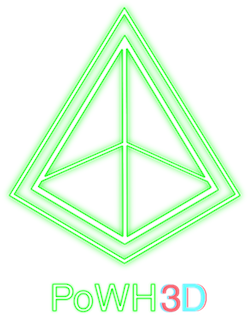 POWH3D is a unique cryptocurrency exchange which allows you to trade Ethereum for P3D tokens. P3D tokens are tokens with a clever twist: Every P3D holder receives direct earnings in Ethereum every time that anyone else buys, sells or transfers the token based on the amounts of tokens (in % out of total amount minted) held. If you want to learn more about this project before purchasing any tokens from the exchange, jump to how this all works and why you'll want to participate. All we ask is that you keep a skeptical but open-mind and do your own research! You probably have a lot of questions. Start here for answers to common concerns. The best part of this exchange is you don't have to trust anyone except the Ethereum network itself to participate! Still curious to understand if the smart contract is legit? Check out this in-depth code review by @RockHardMeat for a detailed analysis of the PoWH3D smart contract. Check out this easy setup youtube video for a video version of the steps below! Details for each step are also outlined below. Are you on mobile? Check the POWH3D Mobile Getting Started to get started! In a new tab, make sure you are using the Chrome browser and then install metamask which enables you to use Ethereum web apps such as POWH3D. Watch the setup video here. 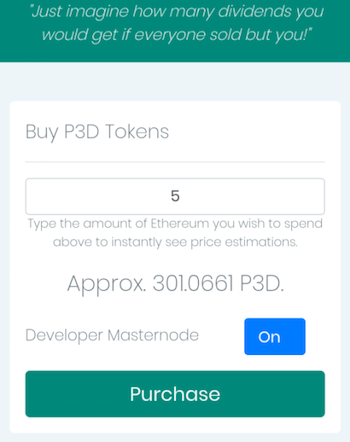 You visit the official POWH exchange and receive P3D tokens by exchanging Ethereum for them based on the exchange rate shown in the top right corner near the shopping cart (i.e 0.01 ETH/P3D). Review the dialog, be sure to set Gas Price (GWEI) to 2 or more and then hit "Submit". Be wary because setting GWEI too low will cause the transaction to take a very long time to complete. Once you receive P3D tokens, they are automatically stored for you on the smart contract by the official exchange. Check the content below to understand more about how this exchange works and why you want to own these tokens. This should autoload the "P3D" for Token Symbol and "18" for Decimals of Precision. If it doesn't, enter those in manually. Now your tokens should show up in Metamask! 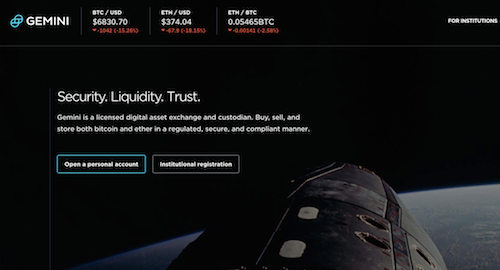 Check your account holdings to see your tokens and your earnings. Read below to understand more about this unique exchange and why you would want to participate. Visit our mobile interface for easy access to the exchange! We recommend you bookmark the mobile interface within TrustWallet for easy access. The core functionality of this exchange is entirely powered only by a deployed open-source Ethereum smart contract. Smart contracts are immutable and this means there is no one who has access to these funds but this autonomous program. You can see the full source code for the contract managing this exchange at any time. You can watch this in-depth contract code review by @RockHardMeat for a detailed analysis. Smart contracts require a transaction to be sent for every action taken. This means that every action you take on the exchange requires a transaction to be sent through by the user on the Ethereum network. 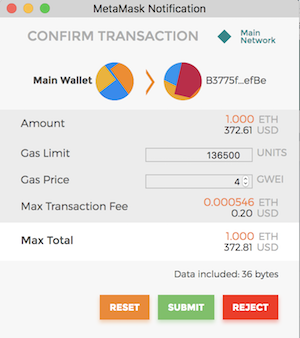 All actions including "Reinvest", "Withdraw", "Sell", "Transfer", etc require a "0" ETH transaction to be sent (with GAS which costs Ether, make sure you account for this!). This is why you see so many "0" ether transactions here. The POWH3D smart contract manages all the funds for this exchange. However, accessing secure smart contract data can be a bit slow at times under high load which is why the main exchange front-end site often may feel sluggish. You can always use backup sites to perform all the same functionality. You can also interact directly with the contract. When you are buying or selling on the exchange, you are buying or selling directly from the POWH3D smart contract, not other users. The POWH3D smart contract is solely responsible for issuing tokens and increasing supply as well as burning tokens and reducing supply. This happens automatically on all buys and sells to the exchange. In addition, the smart contract is solely responsible for determining the value of the P3D token as well. The nice thing about this system is that it inherently doesn't depend on anyone's emotions or input. It is only fueled by it. Emotions fuel the system, but no matter how much fuel, you can always get ETH back for your tokens. In that sense, you are always guaranteed ETH. No waiting for buy or sell orders. No true bag holders. You can sell at any moment. If you have any other questions about the exchange or smart contract, jump into the official POWH3D discord chat and use the #helpdesk! Ethereum Earnings! Holding onto P3D tokens means you are continuously being distributed "free" Ethereum every single time any other user of the exchange buys, sells or transfers P3D tokens. Many holders often report earnings between 0.05%-2% of their holdings on a daily basis, though this fluctuates heavily based on transaction volume. Fair. There was no pre-mine for P3D. Developers and contributors purchased small amounts (1ETH each) with no additional pre-mine of coins. The distribution of tokens is incredibly even. Everyone had the same chance to buy-in and everyone gets earnings only according to their P3D holdings. There is no developer fee. Fraud-proof. The Ethereum you enter into the system isn't being held by any person or group. The Ethereum in the exchange is handled only by a production open-source Ethereum smart contract. Contracts are immutable and this means there is no owner who could decide they wanted to keep the Ethereum for themselves (i.e exit scam is an impossibility). Transparent. You can see the full source code for the contract managing this exchange. The rules of the exchange are clearly posted and no promises are being made. There is a clear culture of honesty and transparency amongst the community and above all by the admins and developers. Decentralized. The entire exchange backend is powered by the smart contract which lives on the Ethereum blockchain and is "owned" by no one. If the site goes down, the contract can always be accessed by alternate front-ends. The contract simply operates according to rules that are fair and can't be changed. Active. There is already a large community around this project. Many users in a supportive community. Join the discord chat and use the #helpdesk if you have questions or just come in to say hello. Many people are committed to the success of this project and to helping newcomers. This exchange is being developed by a distributed collection of admins and software engineers with a wide range of apps and services available for this ecosystem (charts, store, alternate UIs). You can be sure that this is just the beginning and there is a lot in store for PoWH3D! Buy Tokens. Buy P3D tokens, and 10% of your transaction is used to pay earnings to other users. Accumulate Earnings. Accumulate Ethereum earnings as other users buy, sell, or transfer P3D. Reinvest or Withdraw. Reinvest or withdraw your Ethereum earnings as they accumulate. Sell Tokens or Don't! Sell your tokens at any time to receive Ethereum back from the exchange. Share your Masternode. If you buy enough tokens for a masternode, share your masternode link to get bonus earnings! Have Fun! Have fun watching as your earnings and coin value fluctuate over time! As soon as you exchange the P3D tokens for your Ethereum, there is a 10% exchange tax incurred. This means if you exchange 10ETH into P3D the exchange will provide you 9ETH worth of tokens due to that tax. Unlike a normal exchange, that 10% exchange tax is then completely distributed to all other token holders that have used this exchange. The distribution of earnings is divided fairly based on the number of P3D tokens each user holds. The site owners directly keep none of that tax, this all goes to other users. Now that you hold P3D tokens, every single time a new person uses the exchange to receive P3D tokens, you also get paid your share of the 10% exchange tax on their transaction. The amount you receive is based directly on the number of P3D tokens you hold. Keep in mind though that all earnings are paid directly in ETH. In this way, you collect new earnings in real-time on every buy. Even better, you also collect earnings from other types of transactions such as other users selling or users transferring tokens. 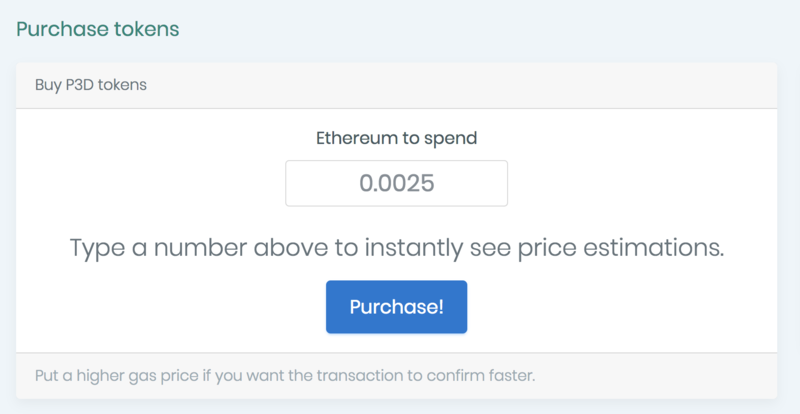 Yes, this means you are getting paid earnings directly in Ethereum every time a user buys, sells, or transfers tokens! As your personal earnings accumulate, you can check the site anytime to see how many earnings you've earned and then choose to either "withdraw" or "reinvest" your earnings. If you withdraw, you get the Ethereum earnings sent directly to your metamask wallet. If you reinvest, the Ethereum earnings are used to purchase yourself additional P3D tokens. Every time a new user purchases a token, the value of each token increases very slightly (+10 gwei). This means that as people buy into the exchange, your P3D tokens are worth more and more Ethereum. However, as people sell their tokens, the value of each token you hold goes down (-10 gwei). Continue accumulating P3D tokens by reinvesting (and/or withdrawing "free" Ethereum from your earnings). If you bought enough tokens for a masternode, share your masternode link to get bonus earnings. For every buy directly purchased from your masternode, you get an extra 3% of the buy-in price. For example, if a friend buys 10ETH from your masternode, you make 0.3ETH in earnings right away! You can sell tokens at any time directly back to the exchange, and the exchange will provide you back Ethereum based on the current sell exchange price. Have fun watching as your earnings and coin value fluctuate over time! Scamcoins generally have big pre-mines where developers take a huge amount of coin for themselves. P3D has no pre-mine. Scamcoins generally involve shady anonymous site owners holding your money while you "earn". These owners could take your money and exit scam you at anytime. P3D has no one controlling your money, the exchange is entirely operated by an Ethereum open-source smart contract which cannot be changed! Owners cannot take Ethereum you put into the contract, even if they wanted to. Scamcoins usually make false promises about guaranteed returns or other claims of ROI which cannot be sustained. P3D makes literally no promises and is completely open and transparent about the mechanics of the system. In short, this is not a scam. This is a unique exchange powered by smart contract which taxes all transactions (buy, sell, transfer) in order to pay out earnings to all token holders! The developers keep no extra fee beyond the tokens they hold. Hacks. If an enterprising black-hat hacker were to discover a security exploit in the smart contract code or in the Ethereum virtual machine, they could conceivably steal all of the Ethereum in the contract. Multiple independent Solidity developers have audited and closely reviewed the contract, so the likelihood of a hack is small but not zero. Stagnation. The lifeblood of P3D is volume and volatility. If the transaction volume slows down or stops (i.e no one is buying, selling, or trading) then this project will generate fewer and fewer earnings. Depending on when you got in, had you not broken even by that point the earnings stop flowing, you would be at a loss. No one knows when transaction activity will dry up, but it's unlikely to happen in the short-term. Unlikely but not impossible. Panic Selling. The value of each P3D token is determined entirely by the buy and sell activity. Every token purchase increases the price and every sell decreases the price by a marginal amount. However, if there was mass hysteria and every single person sold, the value of the P3D tokens would be significantly reduced which would mean your token holdings would be worth very little Ethereum. If there was a massive panic sell, you would of course receive earnings on every sell proportional to your holdings. You would then also receive earnings on every buy as people began buying in again. Would this be so bad? Those are the three major risks for participating. Make your own decisions on if you think it's worth trying! The mechanics of the exchange is that since both buys and sells are taxed at 10%, that you are effectively agreeing to a ~20% tax of your Ethereum when entering into the P3D exchange. On purchase, note that you have only had a 10% tax applied. However, the full 19% tax is reflected in the your "Holdings" amount to be as transparent as possible about the actual value of your tokens if sold. Keep in mind that this sell tax isn't actually applied until the time of the token sale. For example, if you purchase 10ETH worth of P3D, 10% of that will be taken in the earnings transaction fee then distributed to other users. If you were to then immediately sell back your tokens for Ethereum, an additional 10% sell fee is incurred and distributed to all users. This means that if you bought in 10ETH and then immediately sold, you would receive back 8ETH. However, from the moment you own P3D tokens, you begin earning Ethereum earnings for every other user that is buying, selling, or trading. These earnings are provided by that tax, and the earnings you receive on every transaction will mean that, assuming sufficient transaction volume, you will likely break even within a few days to a week of holding the tokens. From that point on, all earnings are profit which you can choose to withdraw or reinvest for even more tokens! Note that there are no promises you will profit or break even. If you purchased tokens, and then literally no one else ever bought, sold or transferred into perpetuity, then you would accumulate no earnings and would have lost 20% of your investment. I would definitely appreciate if you buy tokens using my masternode. Thanks for reading! Reach out to me anytime on Discord @Cryptoknight. After reading this guide, head over to the Home Page for more content, including the frequently asked questions and troubleshooting guide!